Take warm water; mix yeast, salt and sugar in it until the yeast has dissolved. Set aside for 10mins till the yeast gets activated(forms a froth). Sift the flour and add coriander leaves , mix well.Make a well in the center and add the yeast mixture.Mix well to make a soft dough. Add more warm water if required.Knead for 3-4mins. Cover with a cloth or plastic wrap and leave it in a warm place for about 2 to 3 hrs till the dough doubles in volume.Now punch the dough again for 2- 3 more minutes . Make balls from the dough and roll them. Roll them into a oblong with a rolling pin dusting with flour.Sprinkle kalonji over it, press a bit.(optional). Heat the pan on high.Apply a little water on one side of the naan (uncooked naan only) .Put the naan on the tava(avoid non stick pan), with the wet side down. Press it slightly with a cloth or a napkin, so as to stick it on the pan.Within seconds , you can see small bubbles, turn the pan upside down, so as the naan is over the direct fire. Cook it rotating the pan a bit , so as to cook the naan uniformally all over.Check for brown spots. 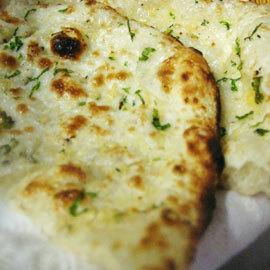 The naan starts to fall down by its own when cooked. Turn the pan again and apply garlic butter mixture over the charred cooked side.